This lovely open area on the landing needed real consideration to give it interest and purpose. 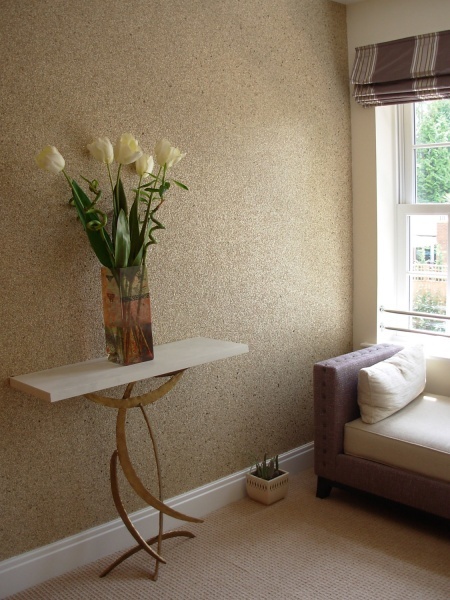 We used a Brian Yates highly textured wallpaper, with the appearance of shimmering pieces of shell, to give the area real definition. This was also carried down the stairwell on the opposite wall. We placed two small, but dramatic, Porta Romana sculptural console tables either side of the area, along with a smart upholstered seat, from French company Collinet. The seat fabrics (from Nobilis) compliment the colours of the silk striped Roman blind, adding warmth to the neutral coloured walls.